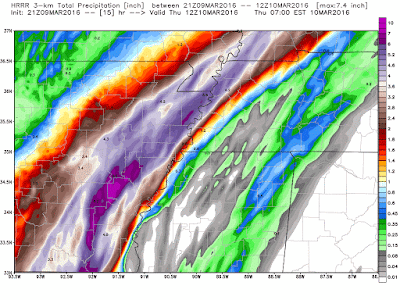 MWN Blog: Rainy pattern is here to stay - how long and how much? Rainy pattern is here to stay - how long and how much? 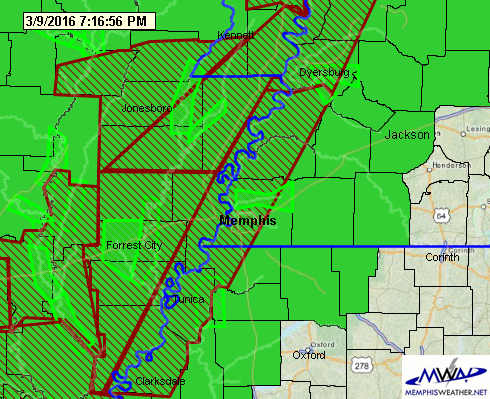 Flash Flood Warnings have been extended further east and now include areas near the Mississippi River on the TN/MS side (red boxes in the graphic below). A stationary front is oriented just east of where the Flash Flood Watches are in effect (green shaded counties) with the axis of heaviest rainfall just west of that front. Models have insisted that the front would pull back to the west tonight, moving the heavy rain axis west of the metro with it. However, with all of the rain along the river, this "cooled" air is effectively keeping the front to our east. As long as it stays east, we'll remain under the conveyor with waves of heavy rain and thunderstorms. The latest high-resolution model data (HRRR model) now thinks the front could move back to about Memphis by rush hour tomorrow. If that is correct, then periods of heavy rain will continue overnight. The HRRR model prints out overnight rainfall totals ranging up to 4-5" west of the river to less than an inch on the far eastern side of the metro (below). Predicted rainfall totals for the overnight hours (through 6am Thursday) from the high-resolution HRRR model. Graphic courtesy WxBell. If these totals are realized, significant flooding issues could result, especially in urban areas, and creeks and streams will overflow their banks. The Loosahatchie River is already predicted to crest above flood stage tomorrow. Additional rainfall will only exacerbate these types of issues. FLASH FLOODING OVERNIGHT IS ESPECIALLY DANGEROUS. It is very hard to see how deep water is (or even see that you are about to drive through low-lying flooding or pooling on roadways). Nearly half of all flooding deaths occur in vehicles. Remember - turn around, don't drown! 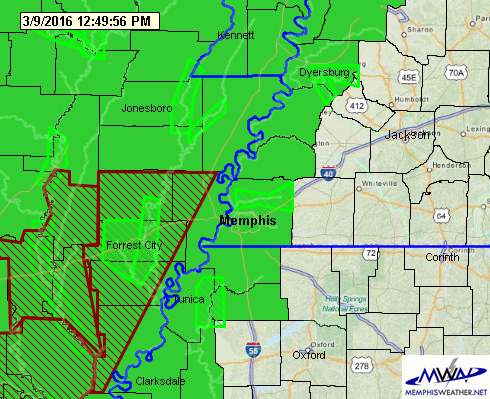 The Flash Flood Watch has been extended east to include the rest of the metro (shaded green counties). In addition, the NWS Weather Prediction Center is monitoring our area for flooding as the "warm conveyor belt" continues to affect the same areas. There is concern that it will move very little overnight in the metro. There's really no much more that needs to be said, but there's a lot that can be said. I'll try and split the difference. Weather systems like this, in which fronts stall, low level jet streams are active, abundant moisture is shooting out of the tropics like a firehose, and waves of upper level energy pulse through the region, are very difficult to predict where the heaviest will fall. Last weekend, we warned of perhaps half a foot of rain, especially in east AR. Forecast totals in the metro dropped early in the week as it looked like the heaviest would remain west of the local area. Within the past 24-36 hours, those forecast totals are starting to climb again. The rainfall forecast from the NWS Weather Prediction Center from 6am this morning through 6pm Saturday aare shown below with generally mentioned amounts of 3-5" possible for the metro. However, you'll need to add the inch and a half received overnight to that! So far this morning, the airport has received nearly an inch more. 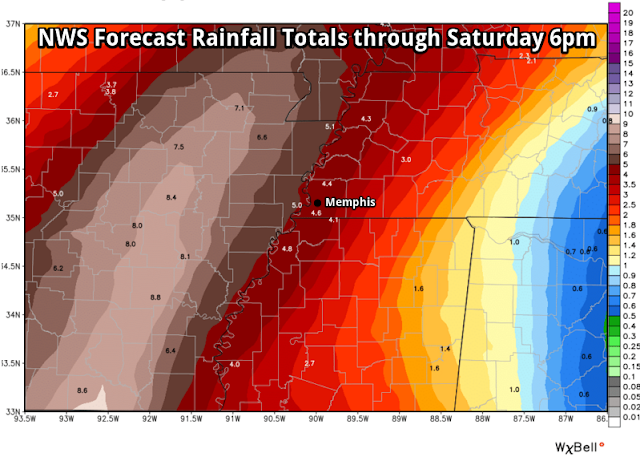 NWS Weather Prediction Center rainfall forecast from 6am Wednesday through 6pm Saturday. As of 1pm, a Flash Flood Watch has been issued for most of the metro, except Fayette and Marshall Counties, and all areas west of the river (green shaded counties below). 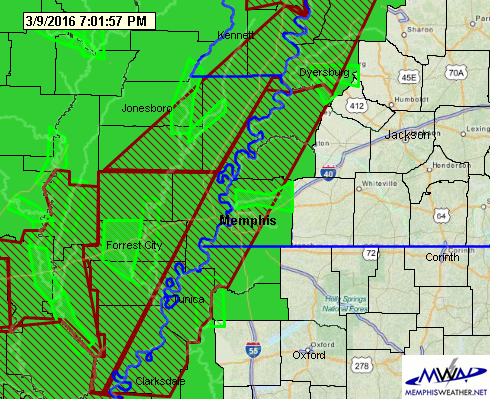 Flash Flood Warnings are also in effect west of the river (red boxes in the graphic below). The lighter green irregular-shaped areas are river Flood Warnings, which includes the Loosahatchie River in the metro. 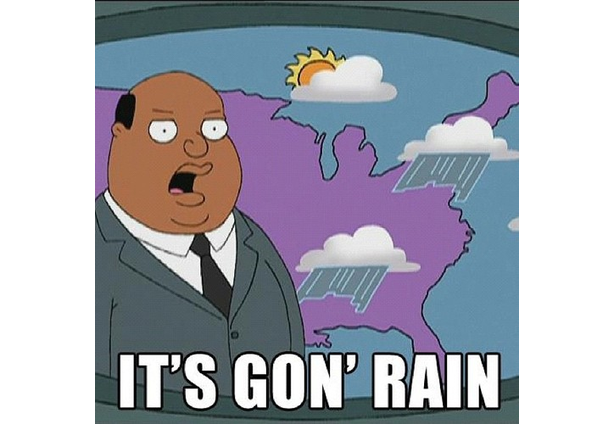 As of now, we're expecting another round of steady, occasionally heavy, rain and some thunderstorms later this afternoon through the evening hours. There are some indications that the axis of heavy rain will shift from the Mississippi River area westward overnight. 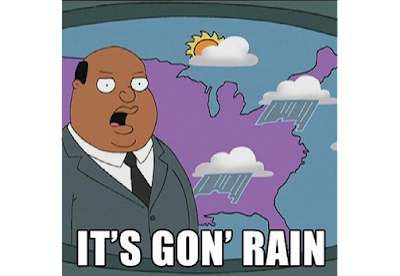 However, another wave of rain will move in tomorrow with thunderstorms again possible. Thursday is likely to be the heaviest rain with this system here in the metro. 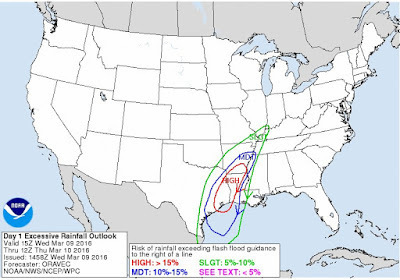 The area is outlooked within a moderate risk of rainfall exceeding flash flood guidance, meaning there is a 10-15% chance that more rain will fall than the ground can handle and flash flooding will ensue. 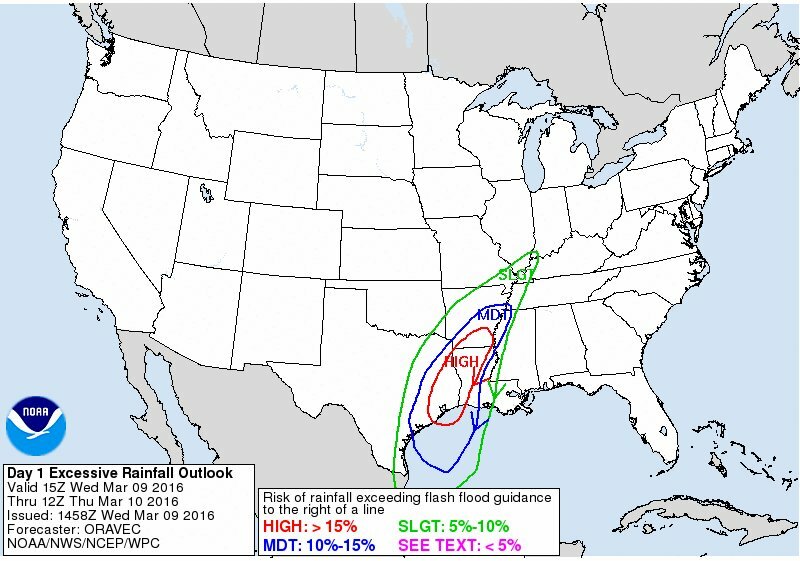 The Excessive Rainfall Outlook for Wednesday indicates a large area in the Lower Mississippi Valley west into eastern TX that will be prone to flash flooding. A Moderate Risk exists from the Memphis area southwest into the MS Delta. By Friday, the overall upper level pattern begins to shift as a low over deep south TX/northern Mexico - which is ultimately responsible for this pattern - moves towards the Mid-South and a front moves to our east. That will mean less very heavy and steady rain over the same areas, but continued elevated rain and thunderstorm chances into Friday and Saturday as the low moves into the region. Driven more by daytime heating, rain and thunder chances should be highest in the afternoon and evening time frame as we head into the weekend. One last round of potential thunderstorms arrives late Sunday as an upper level low moves overhead with dry and very warm weather expected to start next week. So, for the next few days, we strongly recommend avoiding driving into or through areas known to hold water or flood in heavy rain; if you come across these areas, avoid them - turn around don't drown; and be sure your street gutters and other areas where water flows around your home are free of debris. If you are typically affected in some way by rising water during heavy rain, expect those problems again and prepare now. 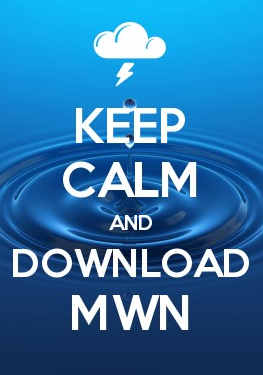 Follow our social channels for the latest information and be sure to get the MWN mobile app for current radar loop, forecast, and Flash Flood Warnings delivered via StormWatch+!